During the dry months of winter, nothing is so luxurious as a long soak in the tub . . . a scented, fizzy bath bomb makes it that much more fun! 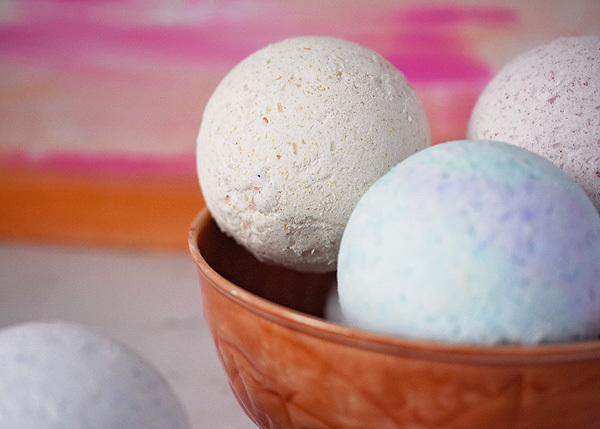 This basic recipe with coconut oil creates six, large bath bombs that you can color and scent as you wish. This is a basic recipe that is easy to customize with your favorite fragrances and colors. You can use essential oils or body safe fragrance oils. I like to combine them. My favorite scent is Creamsicle made with a combination of Orange essential oil and Vanilla fragrance oil. When using essential oils, just make sure you are using oils that do not irritate the skin and in the recommended amounts. When it comes to fragrance oils, I simply add until I'm satisfied with the scent strength. This is usually a dropper full. Mix your dry ingredients (epsom salts, cornstarch, citric acid and baking soda together first. Make sure they are well blended. Using a small glass bowl, melt the coconut oil in the microwave by heating for 20 seconds, stirring, heat another 20 seconds, stir and if needed heat another 15 seconds. It should look like clear liquid at this point. Now you can add your colorant (make sure it is approved for body or food products) and scents. Drizzle over your dry ingredients and mix with your hands. The colorant will brighten as you mix. If you are using a liquid colorant, you will only be able to achieve a pastel shade. Keep mixing until the color is consistent and there are no large lumps. Now you are ready to fill your molds. I prefer to use these round, three inch, plastic molds. But you can also use cupcake tins or candy molds. You want to pack it in tight so as it dries and shrinks, you don't get cracks. I put mine in the freezer to harden quickly. I use these shrink wrap bags to seal mine, but you could also put in a cello favor bag and tie it with a ribbon for gift gifting. Store in a dry location.